SWATH Crew Jacket Available on Ebay! Thanks to our awesome blogger @AmyOfficial for letting us know about this amazing opportunity. This authentic jacket is now for sale on Ebay! The auction ends in 3 days and 23 hours so you better act fast! 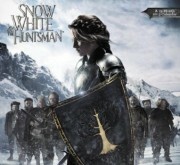 The 2013 ‘Snow White and the Huntsman’ Calendar Reveals New Images! Head on over here to shop when they're available! Thanks to @KstewAngel & @courtjustice for the heads up! They look great! Looks like the date on Amazon has changed to June 5, 2012. Longer wait but make sure to pre-order & get it on the release date! Thanks @vonch for the heads up! & @KStewartUK for the UK release date change! Universal readies Snow White movie push - Lots of merch coming our way! Wide range of licensees on board for action adventure based on the classic tale. Universal Partnerships & Licensing has revealed a raft of licensees for the upcoming Snow White and the Huntsman - which hits cinemas in June. Categories covered include apparel and accessories, publishing, games, prop replicas, costumes and stationery/social expression. Licensees will target a wide range of retail outlets including mass, department, specialty and online, with product launching up to six weeks prior to the film release. SWATH Fansite Presents: A Christmas Guide for SWATH Fans! Christmas is just around the corner and as you make out your Christmas wish lists, why not put some SWATH things on there!? We have compiled this list to show you the best the internet has to offer when it comes to SWATH and Snow White inspired items! Enjoy! It may not be completed yet, but it looks like HMV has gotten a head start on having "Snow White & the Huntsman" on their Coming Soon section of their site. Pretty early, but nice to see it already getting some excitement! Thanks @KstewAngel for the tip! Don't forget to purchase the Sexiest Man Alive issue of People Magazine before it's gone from stores! The mag has a mini SWATH poster right after the cover!